Although there are some unique concerns when it comes to black skin care, there are treatment options and product lines available to help women and men of any shade to have beautiful skin. Following a good daily skin care regimen and visiting a dermatologist who specializes in ethnic skin care for particular problems can help you create and maintain radiant skin. Many men and women of color face challenges with their skincare that individuals of other shades do not. According to Dr. Susan Taylor, an internationally recognized expert on ethnic skin and founder of educational website BrownSkin.net, some of the most common skin care problems when it comes to black skin include acne, ingrown hairs, hyperpigmentation, and keloids. While anyone can suffer from bouts of acne, which is caused by excess production of oil from sebaceous glands, black skin is more likely to develop long lasting skin discoloration. A combination of many factors can contribute to the appearance of acne, including heredity. Although there are many treatments for acne, ranging from over-the-counter creams to presciption antiobiotics, it is best to have your skin evaluated by a dermatologist who specializes in ethnic skin. Many common acne medications have unwanted side effects that can be especially problematic for dark skin tones. For example, the oral antiobiotic Minocycline, sometimes used to treat acne, has a potential side effect of darkening the skin or causing changes in skin color. Many ethnic skin tones have naturally curly hair shafts, and after shaving, whether it's facial hair for men or regular body hair for women, oftentimes the hair will curl back into the skin and pierce the wall of the hair follicle, which can cause ingrown hairs (medically known as pseudofolliculitis barbae). Since this typically occurs after shaving, using alternative hair removal methods such as electrolysis may be an option. A dermatologist may also prescribe topical antiobiotics, retinoids, or other medication to treat the inflammation and irritation of the condition. 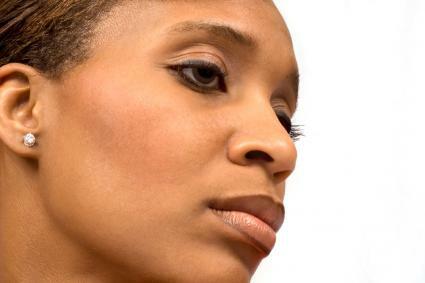 Skin discolorations are a common issue for darker skinned individuals. Post-inflammatory hyperpigmentation is one of the biggest culprits in black skin discoloration. This occurs when the skin becomes inflamed as the result of an injury to the skin, including acne, sunburn, scratches, surgery, rashes, or cosmetic procedures. After a scar heals, the area may remain darker and can take months or even years to fade. Treatments for this condition include lightening creams, topical treatments containing glycolic or other acids, chemical peels, and microdermabrasian. Vitiligo is a common skin care condition where the pigment cells attack each other and are destroyed and replaced with irregular white patches, a very unsightly skincare problem for all skin. The American Vitiligo Research Foundation suggests that several types of treatments to help with vitiligo, including topical medications, skin mini-grafting, and a combination of oral medication and phototherapy. Keloids are a type of scar that results from a scar or wound that heals beyond the size of the original wound. Keloids are typically found on the earlobes, neck, chest and back. Although keloids are particularly problematic because they tend to grow back, keloid treatment includes options such as surgical removal combined with non-surgical treatments like steroid injection. Other treatments, such as cryotherapy, could help the condition as well. There are three things you should do regardless of your skin tone and type: cleanse, moisturize, and wear sunscreen. Choose a cleanser that will remove makeup, oil, and dirt without stripping your skin. Oil-based removers are perfect for dry skin and others have acne-fighting ingredients built in. If you choose a cleanser with an ingredient like salicylic acid to fight and prevent blemishes, be sure you're not doubling up with similar ingredients in your moisturizer. The combined effect could be too harsh for your skin. Those with oily, acne-prone skin sometimes choose to skip moisturizer. Choose a light one instead, and look for one with ingredients designed to control oil or prevent and treat acne. If you skip moisturizer, that can make your skin feel as if it's too dry, causing it to produce even more oil as protection. Applying moisturizer ahead of time will give you a bit more control. Sunscreen is important for any skin tone. Though dark skin won't burn as quickly in the sun as fair skin tones, skin cancer is still a threat no matter what. UV rays can also cause premature aging even if you're not burning when you go out in the sun. Apply at least an SPF 15 daily if you don't plan to spend more than a few minutes here and there in the sun. For longer periods of time in the sun, apply at least SPF 30 and reapply every two hours. Darker skin tones typically show aging less than those with lighter skin; issues such as fine lines and wrinkles often appear later and may be less pronounced. However, there are some issues particular to black skin that come with aging, including an increase in skin growths, more uneven skin tone, and hollowness of the cheeks. Good preventative skin care can help keep skin looking even and beautiful, and cosmetic procedures are available to remove unwanted growths or restore fullness to facial areas. Nyraju Skin Care: Founded by escethician Juliette Samual, this company offers a full line of products for the face and body, including spot treatements, masks, products for mature skin, and scrubs. The products are based on all-natural ingredients. Ambi: A trusted name in black skin products since 1966, Ambi offers an extensive range of face and body care products, including both daily cleansers and moisturizers and products for specific issues, such as fade creams for hyperpigmentation and spot treatments for dark marks. Iman: Well-knonwn for their quality cosmetics, this brand also offers skin care products for normal/combination skin, dry/mature skin, and even a line specifically for those with hypermigmentated skin. Elessia Cosmetics: Tailored specifically to women of color, Elessia's skin care line offers cleansers, toners, scrubs, and gels with simple yet effective ingredients for daily skin care. There are also other companies that specialize in ethnic skin products or brands that have lines specific to darker skin. As with any product, sometimes trial and error is the only way to find out which brands really work best for your specific skin. Following a good basic skin care routine and addressing and concerns with a skin specialist can help you to obtain and maintain beautiful skin. Although there are challenges specific to black skin, there is continuing growth and expansion of the products, services, and treatments available to help everyone have healthy, gorgeous skin.